Oh dear, late again :) Also, my book choice is a little late in terms of school. But I really like it, so I figure you can file it away in your memory banks and save it for next year. Opening: Jessica was a worrier. She worried about everything. She worried about losing her first tooth, and remembering her lunch money, and missing the school bus, and getting her math right. 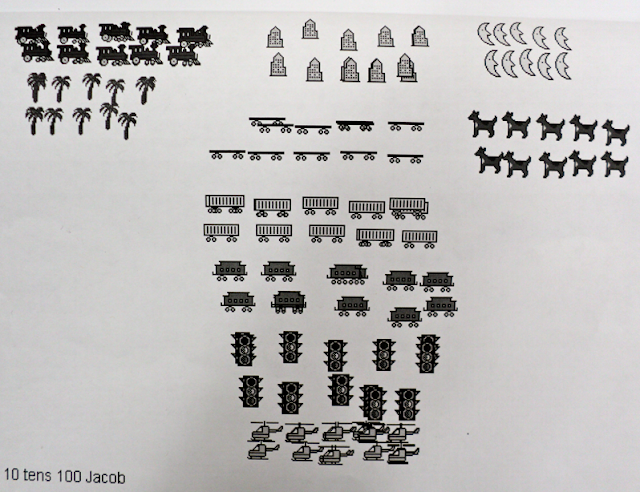 Synopsis (from Amazon.com): When Jessica's teacher tells everyone in class to find 100 things to bring to school for their 100th day, Jessica starts to worry. She wants to bring something really good, but what? 100 marshmallows? No, too sticky. 100 yo-yos? Nah, that's silly. When Jessica reaches the 99th day, she really starts to worry. She still doesn't know what to bring! Could the best collection of 100 things be right under her eyes? Why I Like This Book: It's different from the usual 100th day books, in that most of the focus is on Jessica's worries. I think a lot of little kids can really relate to Jessica and the stressful things in her young life. Also, it has the loveliest ending when her whole family comes together and helps her with her collection .... of love! 1. There are a TON of 100th day activities out there, as you all know :) but if you're looking for a site that has it ALL, this might be it right here. Everything we do in the lab is a lot of fun for Grade 1s, but they really liked making 10 sets of 10 objects using the stamp tool. It was fun, easy and more practice thinking in terms of "bundles of 10" ... still a tricky concept for many first graders. 3. Use this book as a lead-in to a discussion about things your children might be worried about and how to handle them. 4. We played a partner game called Race to 100. The kids rolled a die, put that many stickers in the gumball machine (with 10 in each). They continued until one of them reached 100! They LOVED this game. I love this book. 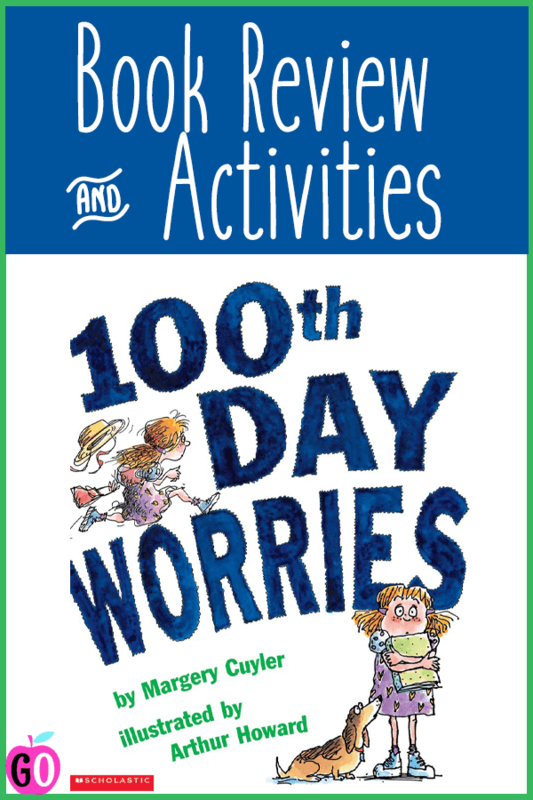 I read it the week before 100th day worries so that the kids know that they don't have to worry too much about what they bring. It sets the tone so to speak. Plus, great idea on KidPix. I want to do more with that. My kids love KidPix. Any other ideas? More importantly, that is the most beautiful header. You are totally amazing. Really. Such an eye for design. Thank you Barbara for these cute ideas. I love *all* of them and will save them for next year. We homeschool so the 100th day doesn't come into play here, but I love the focus on her worries and how her family comes together to help her through. 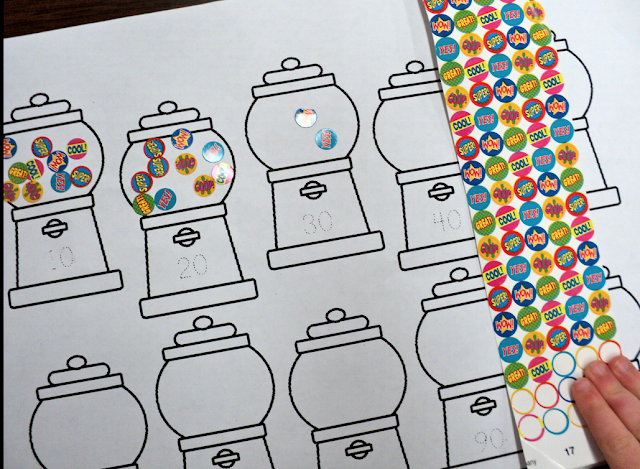 Fun activities for counting, too! I have a worrier! This would be a great book in our house. Plus I love your activities. :) Cute... I love the new look! I am sure lots of kids can relate to this one. Is this 100 day thing big in the US? I can't imagine the worry kids have today in school, especially as we put more test prep, etc. on them. I still dream about being late for class and I'm waaay past those days. :) Thanks for adding this one to the list. I also enjoy reading how the 100 day topic is handled in a unique way. The 100th day is so fun at school. This is a great book to alleviate the jitters kids feel when it comes to fun, yet "big" events. Thanks for sharing. I'm enjoying the PPBF clan! Barbara, this is my first exposure to the 100th day. The story I can relate to and it sounds like there is a lot of support for Jessica. Great book to add to our list! This sounds like a wonderful book. Yes, I know quite a few worriers, myself included! I'm with Pat, it's the first I've heard of this also. Really cool activities! I love doing the stamping on the computer! The kids love this activity! I did the computer thing in my classes when I taught computer. I am retired now. I, also, had them use the paint tools to write the number 100. Then we printed them on transfer paper to take home and iron on 100 day t-shirts. So you can do the 100 in the center, and do the groups in the border/frame. They turned out so cute and the students loved having them to wear for 100 day. That's a VERY cool idea, Penny. I'll have to remember that. Thanks! It's not that far past 100th day, is it? 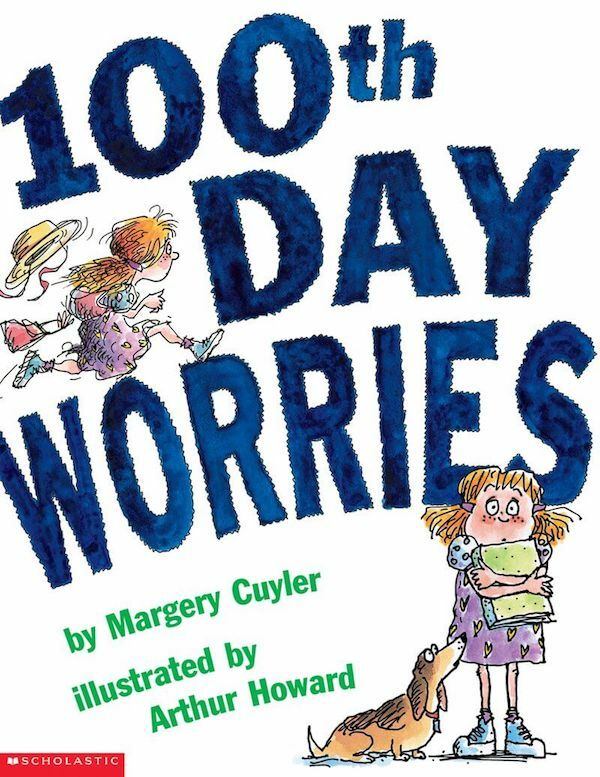 :) This sounds like a great book, and one that can be applied to worries in general, not just the 100th day, although obviously it's perfect for that. Love the activities as always! Thanks so much for adding this book to our list - we don't have any 100th day titles yet, so yours is the first!